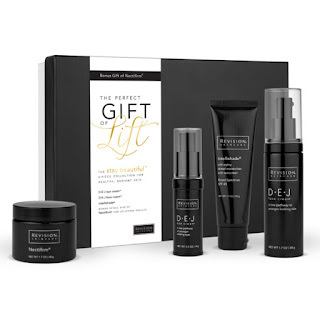 shopspaViolet is Serious Skin Care, Serious Fun: The New Revision Skincare Holiday Kits are Out for 2015 !!! The New Revision Skincare Holiday Kits are Out for 2015 !!! Want the perfect Gift of Lift ? Or the perfect introduction to one of our most popular skin care lines ? The collection includes DEJ Eye and Face Cream, Intellishade Matte or Original ( a shopspaViolet cult fav ) and Nectifirm. DEJ eye and face cream provide new pathways to younger looking skin. Formulated with antioxidants, peptides and extracts, 97% of participants in a 12 week study showed an improvement in wrinkles, brightness and smoothness. chock full of highly effective anti-aging ingredients DEJ eye and face cream is ideal for all skin genres, especially those with mature and dry skin. Intellishade, NewBeauty Best of Beauty award, outsmarts the signs of aging. Appropriate for all skin types Intellishade lends skin a sheer, healthy tint while providing a broad-spectrum UVA and UVB protection. ( I use this every AM ). And last , but not least Nectifirm. The Gift of Lift comes with a FREE Nectifirm! This miraculous neck cream helps skin appear more firm, lifted, less crepey and wrinkled. P.S. I use it on my knees and stomach too. SHHHHHHHHHHH !